Think Tropico, and you think of the rough-and-ready infrastructure of a banana republic; the shacks and cigar factories, propped-up and shaky as the democracy behind them. Related: the best strategy games on PC. But the technology that powers these darkly comic city-builders need not be as shambolic. As control of the series shifts to a new despotic studio, its codebase is switching to a new engine – to Unreal Engine 4 and a picturesque, multi-island simulation. Tropico has already been rebuilt from scratch once. 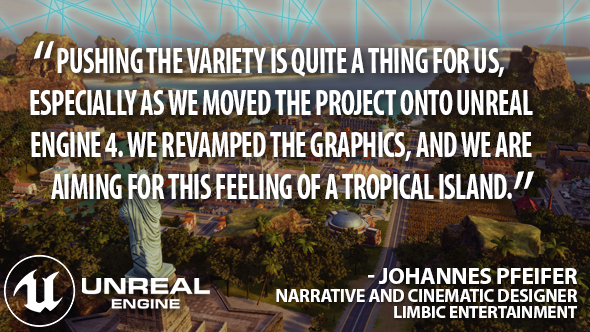 For Tropico 5, then-developers Haemimont Games decided to start again to get away from the tangled systems built up over numerous games and expansions. It was that legacy code that caused Tropico 4 to freeze irreparably when, for example, your election opponent married to his great-grandmother. New developers Limbic Entertainment – who have history with the Might & Magic Heroes series – thought they could do better by building on top of a more stable platform: Unreal Engine 4. 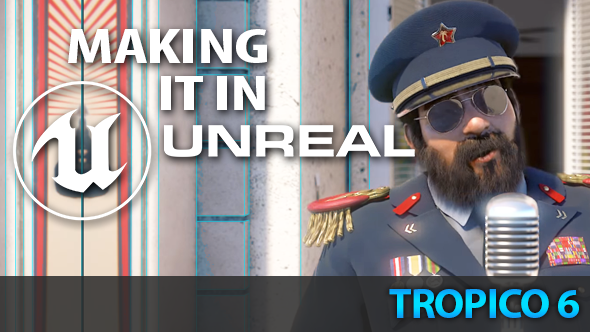 The change has allowed Tropico 6 to double down on deeper simulation. Remember the much-vaunted independence of SimCity’s citizens? The GlassBox simulation AI that proved disappointing at launch? Limbic are working on something similar (and hopefully much better), whereby individuals are the driving force that powers your country’s mills and factories. In this Marxist new vision for Tropico, if you can’t see a Tropican arriving for work, then the work simply isn’t going to get done. How’s that for seizing the means of production? “Basically [as a developer] you can define the buildings, how they work, and that they perform certain actions over time so they generate goods,” Pfeifer explains. “Or you tie that to the Tropicans. Only when a Tropican is present, not on leisure or in a bar somewhere drinking, will he produce goods. A heftier simulation has a greater impact on performance, but Pfeifer says it’s no more than the engine can handle, and worth the extra strain. Tropico 5 was a decent-looking game for its time and genre, but it still suffered from the sickness of most city-builders: a presiding flatness that made its maps seem like sheets of graph paper simply waiting for the simulation to be written on top. 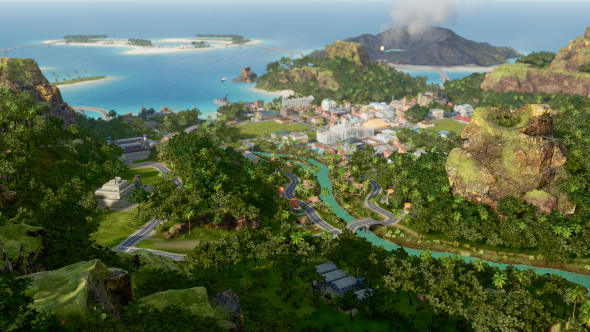 Early screens of Tropico 6, however, depict mountainous, wooded regions that contrast with the undulating sands of its Caribbean paradise. Tropical islands, even. 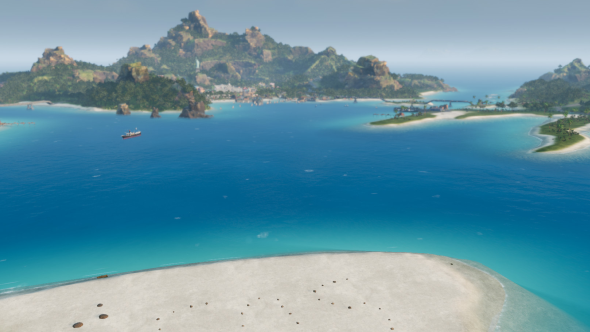 Whereas previous games in the series stuck to just one, Tropico 6 plays out across a whole archipelago of varying sizes and terrain types. “The visual variety we have is [on one side] rather green, lush areas with interesting topography, and on the other side a volcanic island with running sulphur streams,” Pfeifer expands. 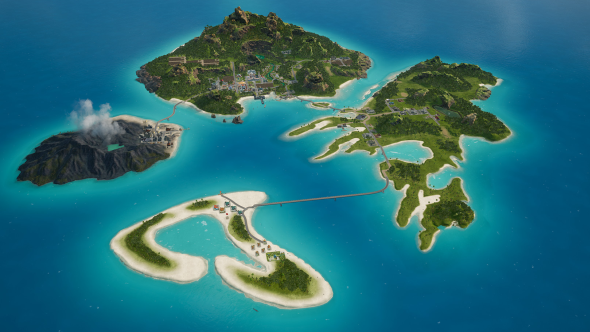 “Adding these little details really make it feel realistic – the shape of the islands comes from a natural standpoint. Where road-laying on land tends to be a structured affair that takes into account the placement of existing buildings, Limbic decided that transport between the islands could stand to be a bit more freeform. They’ve put together a “fully dynamic” system of bridge building, which allows new roads to snake out across the water towards other parts of the archipelago. This is where Limbic’s new systems begin to interplay: because their new Unreal-powered simulation tracks individual citizens as they travel to and from work, it’s in your interest to make sure they get there in a timely fashion. To that end, you’ll need to take advantage of new bus lines – another “fully dynamic” system that allows for optimised routes through your republic. Limbic have opted not to narrow down their release window of 2018 just yet, mindful of “a lot of balancing” to come. Perhaps they’re wary of the many, varied systems in Tropico’s code colliding again. Tropico 6 will come to PC in 2018. Unreal Engine 4 is now free. In this sponsored series, we’re looking at how game developers are taking advantage of Unreal Engine 4 to create a new generation of PC games. With thanks to Epic Games and Limbic Entertainment.